Mixteca High and Low, day 1. 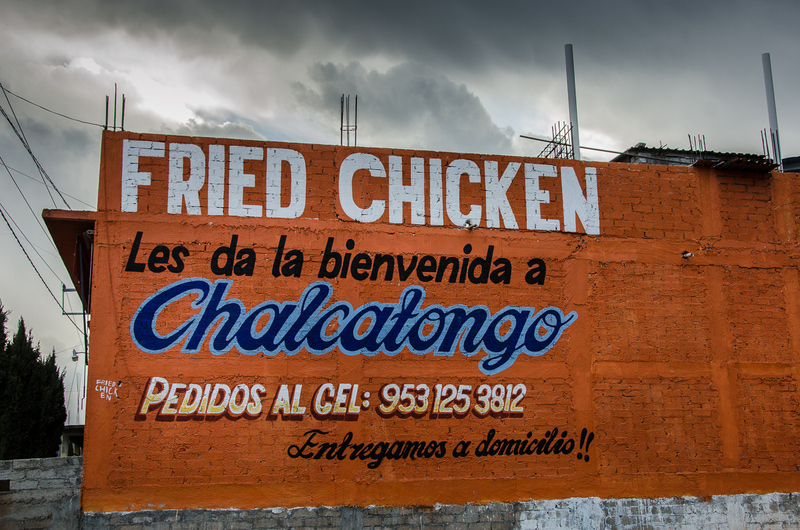 Fried Chicken welcomes you to Chalcatongo! 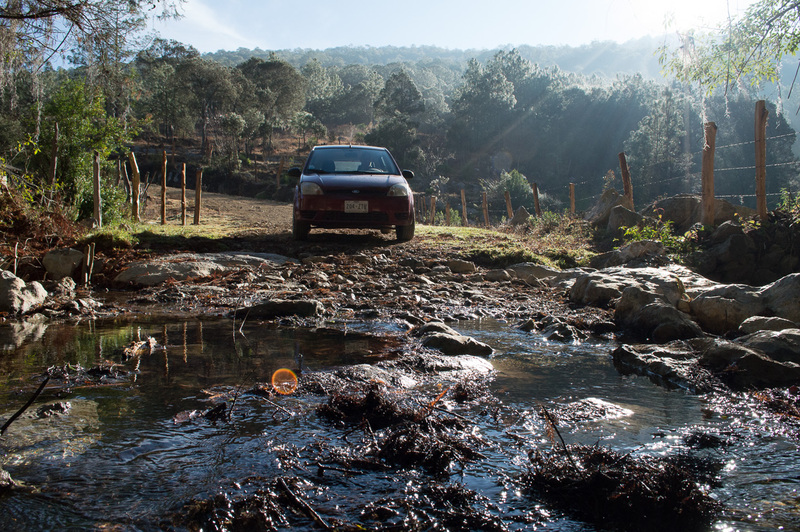 This was our welcome into the deeper reaches of the upper Mixteca. High country of pines, low mountains and hills nibbled to the nub by sheep and goats. Eight thousand feet above the ocean and frost on the windshield at dawn. Old country where the ancient Mixtec kingdoms once ruled and the old time artisans made some of the finest gold jewelry and alabaster sculptures seen in the Americas. Most of the few books that survived the conquest are from this area, offering a glimpse into the elegance and complexity of the old Mixtec societies. 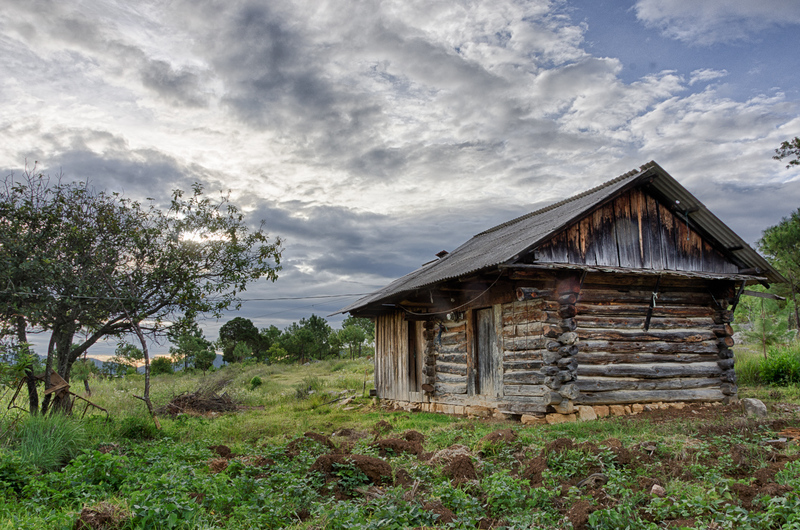 Unique in this pine covered highland is the log cabin architecture…one after another well-made rectangular pioneer-style log cabin with steep, wide-eaved tin or shingle roofs , or a newer version where large chainsaw cut planks take the place of the logs. And then the even newer versions with builders emulating the old design but making them bigger and fancier, two stories tall, sometimes even three, with especially wide eaves and even four sided roofs…looking something like a cross between Uncle Tom’s Cabin and a Japanese pagoda. But by the time you’ve made it to Chalcatongo you’ve gotten deep into the Mixteca and the architecture belies that fact. See, the thing about the Mixteca is that…high, cold, dry, thin soiled…it was an act of true mastery carried out by those old time peoples to build civilizations on this stingy land. These days it is better known for its erosion and for having the highest rates of immigration to the United States in all of Oaxaca. The deeper you travel, up to a certain point, the more immigration you’ll find. There are vans and pickup trucks in the streets with license plates from New Jersey, Texas and California. You will encounter guys on the streets who say, “good morning man, how you doing?” There are even Chinese restaurants! The new Mixtec houses appear as a version of the American sheet rock palace. There are large two or three story trophy houses with gabled roofs, dormers, ship lap wood-like siding, front porches, all expertly made from concrete. The architecture speaks bold statements saying loud and clear, “I made it big!” These are also non-verbal expressions of “I’m not an Indian!” which in Mexico means third class citizen. The streets of Chalcatongo, and the towns further down the road as we travelled onward, were dotted with these statements of success and efforts to bury inherited shame. Amazingly opulent places, some even actually made out of wood by skilled carpenters who learned their trade framing houses in the suburbs of Las Vegas and Phoenix bringing their tricks back home and hewing 2x4s with chainsaw mills. Travelling through this landscape of migrant dreams and lost heritage, we slowly headed into an area where the houses faded away and the woods grew big. We saw pine trunks in between sharp karst limestone boulders that opened to grand vistas of deep spreading valleys and ridge line after ridge line. Then we zig-zagged out of the highlands, rattling through the little towns of Yucunicucu, Zaragoza, Monte Verde, Tezoatlan. Distracted we missed the right connector road somewhere I suppose. So we went winding down through oaks on a narrow little track that held little promise of going anywhere until we came to a clear stream lined with big cypress trees and a creek crossing that threatened to swallow up my little car. But she got us back on track and by brunch time we arrived in Santiago Nuyoo, near neighbor to Santa Maria Yucuhiti. These two towns were our day’s destination. Side note here…I’m saying “we” and “our” here so let me introduce she who makes the adventure plural, Marina; my photography assistant and sweetie who also takes most all of the behind the scenes photos of these photo outings, but leaves the driving to me, and we like it that way. Nuyoo and Yucuhiti, two Mixtex towns sitting on a little slope at the head of a canyon under the semi-circle amphitheater walls of enormous limestone cliffs, one hell of a dramatic spot! Why did we decide to drive hours down convoluted dirt roads to get here? Because we’d heard a rumor that people might still wear their community fashion here. 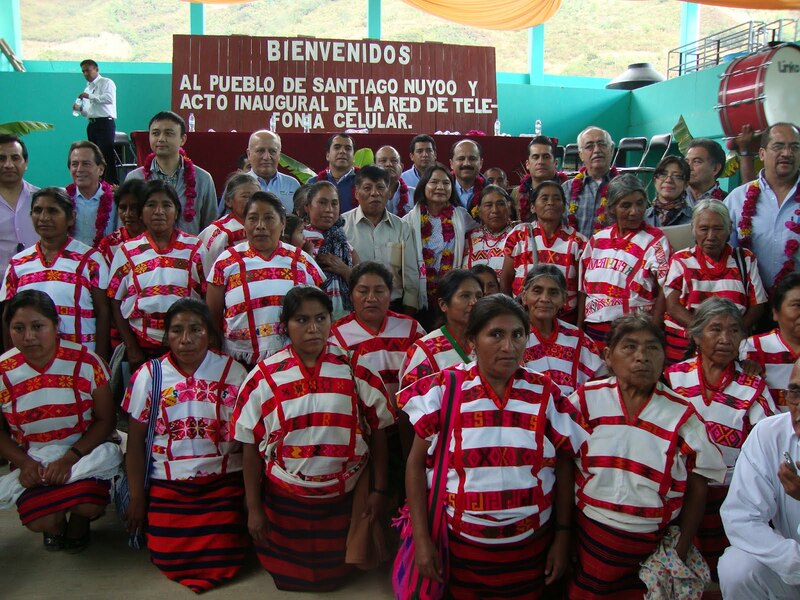 Let me say right here at the outset of writing about the field work for this book that there is no guide book to the textile villages of Oaxaca, there is no text book, there is no series of published academic papers telling one where these villages are. However there are two important resources, both with their pros and cons. One is word of mouth, which is usually accurate, but can often be hard to come upon and often with limited reach. 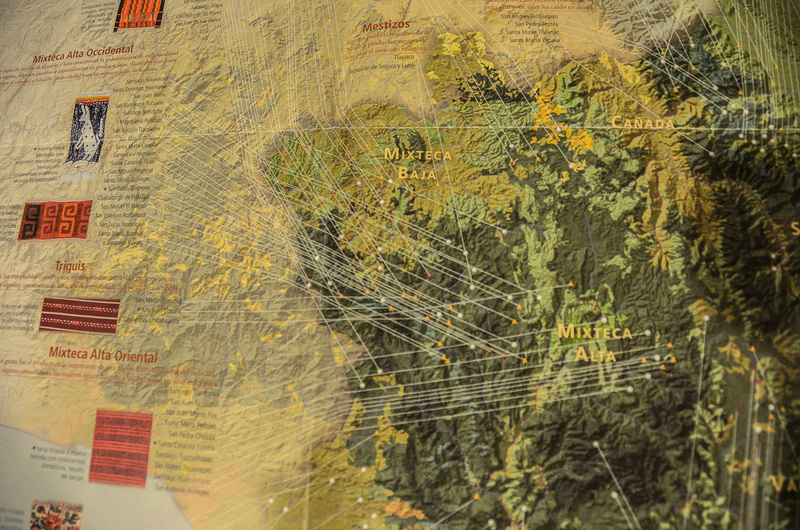 The other is the recently published map of Oaxacan textiles put out by the Museo Textile de Oaxaca, which lists every place they’ve ever heard of that in the last 100 years had a textile tradition. This map is a gold mine of information, no question about it. However it has some idiosyncrasies that makes this exploration all the more interesting. It lists villages with symbols as follows: 1) UPSIDEDOWN ORANGE TRIANGLE= Once having a textile tradition, but not anymore(we are not interested in these villages for this project, they are textile extinct) , 2) RIGHTSIDE UP YELLOW TRIANGLE = having an active textile tradition (we are interested in these villages), or 3) WHITE DOT= uncertain if there still is an active textile tradition (we are uncertain how interested we are in these villages, they are a crap shoot). The other idiosyncrasy of the map is that it has so many villages and so many small lines indicating those villages that is near impossible to read. But that’s how treasure maps should be, riddles in their own right, and this one is most certainly a treasure map and most certainly filled with riddles. Deciphering the riddles, I found Nuyoo and Yucuhiti with this map, both listed as having a yellow triangle active textile tradition. I then followed up by doing an image search on google to see if anyone had posted images from these villages showing people dressed in village fashion. And bingo, I found a couple of good images. So between the two solid clues I planned the visit. But a couple of important details: First, the textile map’s aim isn’t to talk about villages where people still dress in their villages clothing, but rather to identify villages where there is or was or might be an active textile tradition. If they are weaving or embroidering, that is an active tradition of course, but it doesn’t mean anyone is actually wearing their work in their day to day lives. Meanwhile, the key to being included in my project is that the textiles have to be used on a daily basis by someone in the village. That is the parameter I’ve set to call something “Living Threads”; the threads are still walking, working and dancing on someone’s back and hips, part of their life every day, and part of a continuous heritage dating back who knows how far…but a long time to be certain. The other important detail is that while pictures of people in a village dressed in village fashion found in an image search on Google is a great clue, it is wise to remember that in many villages the old style has been relegated to the role of the tuxedo, pulled out of the closet only for special events. And these are the kind of events that then get posted on the internet and indexed by Google. And this was the case for both Nuyoo and Yucuhiti…yes, as the textile map suggested, there is still a textile tradition here, some women do still weave. But no, they don’t wear their community unique dress anymore, except, as in the case of the photos, when a big wig comes to town and is received with honors. We got here a decade too late. So we had a brunch of huevos a la Mexicana with orange juice in a backroom kitchen that served as Nuyoo’s main restaurant and then headed on down the line.